I stood in my kitchen growling over yet another bad recipe. I don’t know why, but I have terrible macaroni & cheese karma. I’ve tried everything. I even went as far as making all of Alton Brown’s recipes from Good Eats. Well ok, I didn’t fry mine into blocks. That’s going a bit too far. I tossed the recipe in my hand into the garbage and Scott quickly instructed me how to make the most simple, most wonderfully creamy, and by far the best macaroni and cheese I’ve ever had. This recipe is a keeper! I love my foodie friends. Thanks Scott you are awesome! Use flavorful, good quality cheese in this pasta. It makes all the difference. 1. Begin boiling the water and cooking the pasta according to package directions in heavily salted water. Meanwhile, grate the cheese and toss with 3 tablespoons flour. Set aside. 2. In a large pot melt the butter over medium to medium high heat. Stir in 6 tablespoons flour (1/4 cup plus 2 tablespoons to make it easy), and salt. Cook until golden stirring frequently. Very slowly pour in the milk stirring completely into the flour as you go so lumps don’t form. Add lots of freshly cracked pepper and stir the mixture constantly until thickened. Turn off the heat and add the cheese. Stir until melted. 3. When the pasta is done cooking, set aside about a cup of the salted pasta water. You'll need it for the sauce. Drain the pasta and add it to the cheese mixture. Stir gently to combine. Add pasta water as needed to make creamy. Recipe by Dishboy Scott. Picture by Laura Flowers. This sounds and looks delicious. I guess sometimes simplicity works best. I will have to give this a try as I have yet to find a good Mac and Cheese recipe as well. Great looking mac n cheese. That reserved pasta water is a great idea. Wow, it looks so creamy and yummy!! Creamy sounds good! I love homemade mac and cheese. I did not make home made mac cheese until I went home to Texas last August and made a blogs version, and it was killer with restaurant quality high fat cream, talk about creamy OMG! Yours looks good, and now my friends are calling wanting me to come back to TX and make that again with my friends pecan smoked brisket...gosh I am hungry and its after 10 PM now! I've been making this exact mac & cheese for decades and it always is a hit. The only occasional variation is to add bacon bits to the white sauce (same time as you add the milk) that way it flavors the whole sauce. It really is a keeper. You have Coleen? Why didn't you share lol?!! Bacon bits are going in next time. Thanks that is a fantastic idea! Of course this looks completely tempting and delicious. I love the pasta choice and it does look creamy! And it's pretty simple, too! win-win! Oh, I love how much cheese is in this dish! I must try this out!! 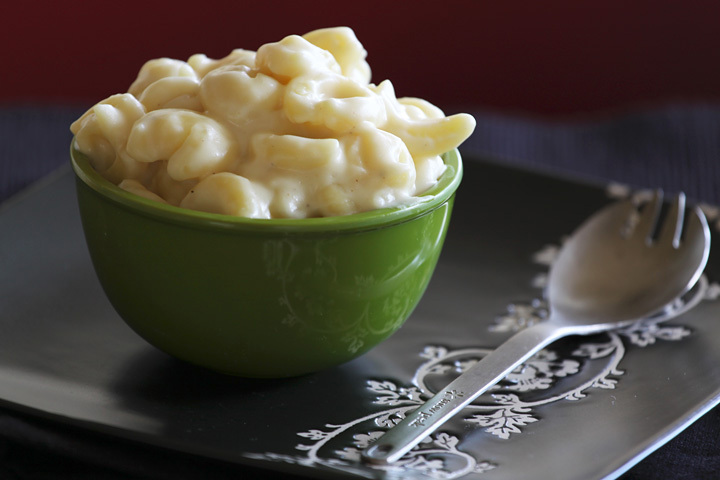 A grand looking macaroni & cheese! looks scrumptious! We make Macaroni cheese with Spaghetti - Spaghetti Cheese [original name eh?] - it's lovely - try! Less lumpish than macaroni. This looks too good to resist - it is so going to be great with brisket this weekend! I could never do a good mac and cheese either - but I was too ashamed to admit it! Thank you for sharing this one. Your recipe looks wonderful. I do something quite similiar. First, I brown a little onion in butter, add a little flour. Cook that for a minute or 2 and add 1/2 & 1/2. As the milk heats I add the cheese. I normally use some of the reg. velveeta and some of the mexican velveeta for just a little kick and then mix in my choice of cooked pasta. You can soup it up a little by adding cooked shrimp or crawfish or cooked crumbled sausage. It's a meal when you add a salad! Thanks for all of the wonderful ideas! I've never made a decent mac-n-cheese either, but this looks great! I know I say this about everything, but macaroni and cheese has been a favorite since I was a little girl! :) My mom would make it for me on every birthday, or special day(returning from 6th grade science camp:)). I have never quite been able to get her recipe "just right":( I will definitely have to give this one a shot! Thanks, Laura! you are now tempting me to branch out the safe and known kraft world and into the homemade! i'm not such an expert cook but, you've inspired me to be a brave girl and give it a go! Mmm I can never turn down some creamy homemade mac & cheese. We've only made one recipe - can you believe it?! Thanks for another one to try! Meaghan you are so sweet! Thank-you! Foodie friends are the best! Looks great! I love the picture - the recipe sounds great, too!! It did look like the creamiest ever... how does that work? I hate the dry stuff and so often in recipes that's what happens... love the photo... you capture the heart of creamy! I've screwed up mac and cheese before too. Don't feel bad. This recipe looks great! I'm always up for a good mac and cheese recipe. This looks like one that my hubby would like... My brother, too! Ok... All of the men in my life would totally LOVE this. Oooh don't you love recipes like this? Easy and luscious! I love mac & cheese and this looks incredible! Thanks James! I made that one about a year ago, but was so tired at the time that I messed it up. No fault of Mr. Brown! I've only attempted mac and cheese once and was so disheartened by its slightly grey look and texture I gave up (no idea why it was greyish...) will def. give this one a try! also, you can add a little cheddar topping and grill until brown in the oven (in this case make the cream a little more liquid than usual, it will thicken while grilling). Serve warm. Yum! I wish I had a bowl right now! This looks very simple and luscious. I'll definitely try it out next time the bf craves mac & cheese (instead of the boxed kind he usually goes for =X). We tried this one not too long ago - man oh man, was it GOOD!! And it keeps so well, which is always a plus when there's only two people eating. The day I ate the last of the leftovers was a very sad day indeed. Cate thank-you for telling me! I'll pass that on to Scott. He'll be really happy to hear that. I make a mac and cheese that's baked. It's super yummy but not ooey gooey. This looks so fantastic. I'm going to try it tonight or tomorrow night. I have the ingredients and it'll just depend on how well the toddler goes to bed if I want to stay up and make it. Fingers crossed that it goes better than the pudding (which I tried 4 times and just gave up). I'm just destined not to be able to make any desserts. April omgosh! I am so sorry. I feel like I should send you a few boxes of pudding mix. Yikes! I wish I was there to help you. Then I could figure out what's going on. Sighh... Well anyway I hope you like this one. It's not a dessert at least. Oh, I never came back to say that I've made this twice since. The first time with a longer macaroni and the second time with standard elbows. I also changed cheeses, but both were extra sharp cheddars. I liked the Trader Joe's cheddar best so far. I have to imagine this will freeze, too, which is what I may have to do because the husband doesn't eat mac and cheese and I hate the knowledge that I eat the entire batch by myself (over the course of a week). i need this. right now! mac and cheese is my GO TO comfort food. yum!